If you have trouble viewing the pictures in this email click here Lewis Creek Farm Spring-dug Parsnips A Vermont Tradition* Freshly harvested Now available wholesale (Order Wednesday for Thursday delivery) Extra sweet from being in the ground all winter *Back in the day, Parsnips were never dug in the fall, they stayed in the ground all winter and were dug first thing in the Spring. 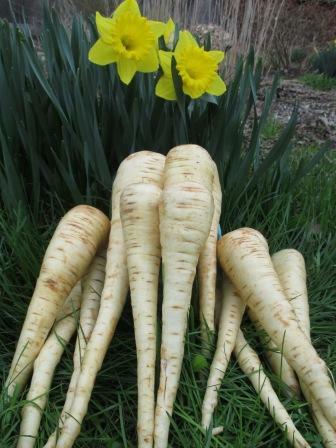 Just as Sugaring was ending, Parsnips were the first vegetable to come out of the garden. To survive the frozen ground in the winter, Parsnips convert their starch to sugar, which acts as an anti-freeze. Freshly dug in the spring they are incredibly sweet! If you would like to stop receiving these Lewis Creek Farm In Season emails, please click here, and just put the word "Remove" in the subject title.